Regardless of your purpose of using it, a rifle’s usability depends upon the frame that holds your chosen parts together. A great housing needs a sturdy structure. So it makes perfect sense the lower receivers with sturdy built are necessary for building your customized AR 15! In this article, we feature the best AR-15 lower receivers which will perfectly compliment with other AR components. What’s AR-15 Lower Receiver Made From? Lower receivers fall into two classes: 80% lower and stripped lower. The first type is growing in popularity among gun builders. The percentage means it’s 80% completed. Anyone can also buy this type without being required of a Federal Firearms License (or FFL) because it’s not considered a firearm. For stripped lower receivers, it’s considered a firearm part because it has been completed. It’s ready to be assembled, and no further finishing required right out of the box. Thus, an FFL transfer is mandatory, and the manufacturer issues a serialized number in every stripped lower receiver they sell. 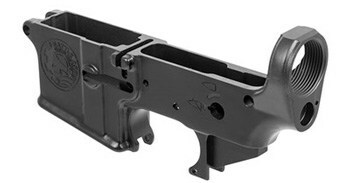 The AR lower receivers are made of either two main materials: the aluminum and polymer. Each of them has their own pros and cons. Let’s discuss them one by one. Aluminum is popular for being durable yet lightweight at the same time. It has high malleability and high resistance to corrosion and rust. It is also ideal for both electrical and thermal conductivity. These are some of the reasons why some gun parts comprise of aluminum. There are two grades of aluminum used in lower receivers. These are 6061-T6 and 7075-T6. The first aluminum grade type is used for most purposes such as vehicle frames. It’s easy to weld, extrude, and forge. 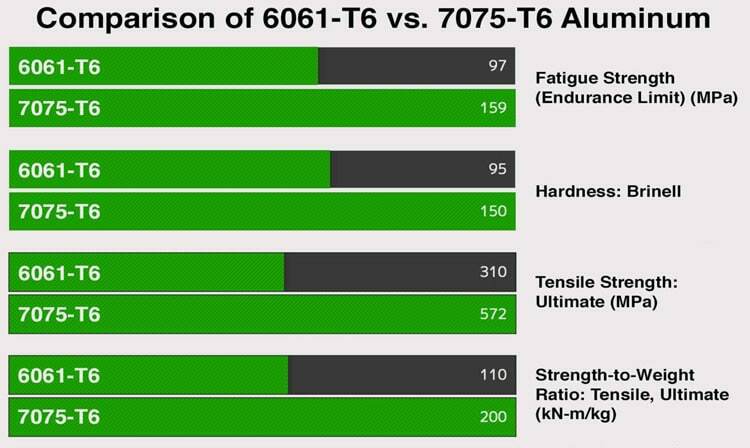 However, it’s not as strong as 7075-T6. 6061-T6 aluminum. It’s also easy to machine and results to minor wear and tear on the machinery. This second grade exceeds the 6061-T6 aluminum in many aspects. It’s a recommended metal to have when you’re looking for superior strength and durability. It’s a Mil-Spec material, and this makes it ideal for weapon manufacturing. Drawbacks of 7075-T6 include the difficulty in machining and its high price. Aside from choosing between 7075-T6 and 6061-T6 aluminum, you must also make a choice between a forged lower receiver and a billet lower receiver. 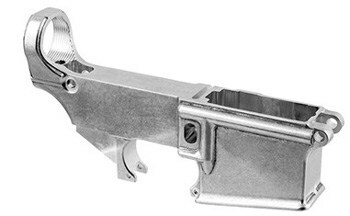 The forged aluminum is the most common type of aluminum metal for lower receivers. It’s considered to be the strongest, and its price is just right. The process of procuring this metal type is forging. The hot aluminum metal is hammered into the general shapes of a lower receiver. After that, the metal is subjected to heat treatment to strengthen the metal further. The finishing process includes the drilling of holes, tapping threads, softening the sharp edges, engravings, and coating. On the other hand, the billet lower receiver is carved from a single billet block by a CNC machine. The process could take a few or several hours depending on the specifications. Billet lower receivers tend to be on the expensive side because it is time-intensive and a lot of material is wasted during the carving. The polymer used on lower receivers is not an ordinary polymer. Since the lower receiver will be subjected to different types of wearing and abuse, it’s only natural that the polymer must be tough. Polymer lower receivers are gaining in popularity and with good reasons. They are lightweight and easy to produce. Also, they can resist shocks, impacts, and harsh chemical solvents. However, you must always remember the polymer can’t beat aluminum regarding strength. Various lower receivers are available on the market with different designs, prices, coatings, and qualities. To help relieve your dilemma in choosing the best AR lower receiver, here is a list of the top lowers. Assembling a rifle is one of a gun collector’s enthusiasm. We highly recommend Anderson’s lowers especially if you are going to have your first build. They are reasonably affordable and give you more room to grow your skills. This lower receiver has Mil-Spec dimensions. This means you can easily find the upper receiver you’d like to combine it with. This product has a standard and pre-cut magazine well for your standard AR magazines. The lower receiver uses 7075-T6 forged aluminum which is the strongest material you’d ever find on lower receivers. In fact, its quality is unyielding that it exceeds the standard lower receiver of the AR rifles. Various gun collectors who make it a hobby to build their custom guns highly appreciate and recommend the metal used. Specifics of this 80% lower receiver are the receiver extension and grip screw hole which has already been drilled and threaded. Also, it has a Cerro Forge keyhole mark located on the rear right of the trigger guard. There are also some words engraved like “fire” and “safe” found above the trigger guard. Furthermore, this one fits into universal jigs. We found some problems on the rear takedown lug. It’s not properly centered and not wide enough to allow the rear lug of the upper receiver, should they combine. Careful filing may correct this issue, but it could be time-consuming. 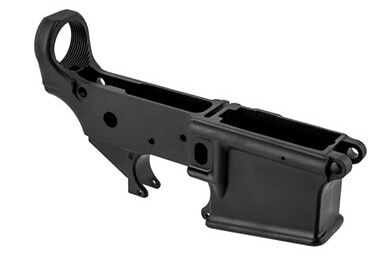 This lower receiver’s finishing can either be unfinished or anodized black. If you’re more on the custom track, we recommend you to purchase the Anderson 80% lower receiver with the raw finishing. This won’t limit your trials which might result to scratching later. Once done, you can spray-paint the lower receiver with your desired color. For the anodized black finishing, you can expect additional strength to the receiver walls. The coating has superior abrasion-resistance fit for rugged field use. Upon purchase of this lower receiver, some remaining operations are required to complete it. First is the milling of the space for the fire control group. Second is the drilling of the trigger pin hole and hammer pin hole. The third step is the milling of trigger slot. And the last step to undertake is to drill the safety selector hole. Anderson Manufacturing is a powerhouse brand for its quality lower receivers at a reasonable price range. Another product in this list is the Stripped Lower Receiver. This is a great platform so you can build your custom AR 15. It caters to multiple cartridges namely .223 Remington and 5.56 mm NATO. Just like their previous product, the 80% lower receiver, this stripped lower has Mil-Spec dimensions. It shall fit on most upper receivers and other aftermarket components. This part has a standard and pre-cut magazine well for your standard AR magazines. It features a standard open trigger guard. The hard material used to prove its durability is 7075-T6 aluminum. It’s a forged aluminum which means it’s the strongest material to be used on a lower receiver. 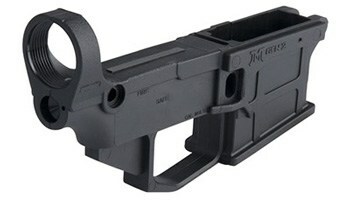 This Stripped Lower Receiver has only one finishing available. The matte black hard anodized finishing enhances the strength of the receiver walls. The coating then has a great abrasion resistance for rugged field use. In machining this particular lower receiver, you are required to use short ¾” long grip screw. The standard AR 15 grip screw does not fit. 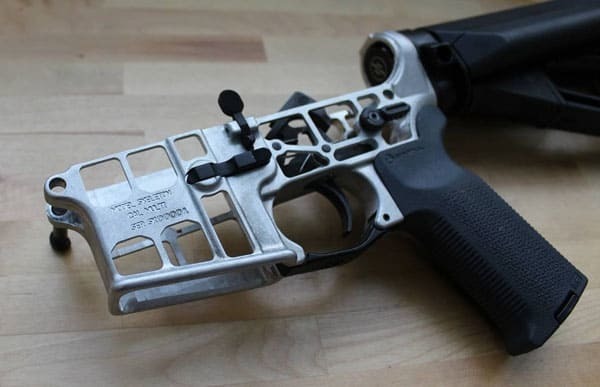 In assembling the lower receiver with other AR 15 components, the lower receiver fits their connecting parts. It fits snugly but not too tight. Also, the takedown pins can be hand-operated meaning that there’s no need for milling and hammering. The safety selector of this lower receiver is also snug. Battle Arms or simply BAD specializes in innovating and selling gun parts to various gun owners and collectors. BAD’s lower receivers are well-received despite the high price range. They offer some entry-level models and even advanced receivers. BAD-15 belongs to the entry-level category of lower receivers. You can use it for your first build. It’s classified as “Multi caliber” which means it accepts different cartridges. For BAD-15, it’s compatible with .223 Remington and 5.56 mm NATO. BAD-15 has the typical Mil-Spec dimensions. You won’t have difficulties looking for AR 15 aftermarket components that will fit with this lower receiver. The specifics of this lower receiver include the magazine well to be precisely cut with wire EDM. BAD deemed it necessary to smoothen the inner surface so that the magazine will fit well. All the pin holes and the safety selector are reamed instead of drilled. The same can be said to helical rear receiver extension threads. They now have perfect alignment. BAD has the usual features but the technology used is more advanced. As evident from its very high price, you can find no significant drawbacks in this lower receiver. This can be too much for an entry-level lower receiver, though. Just like other standard lower receivers, BAD-15 is made from 7075-T6 forged aluminum. The Battle Arms logo is engraved on its right side. It’s consistent because BAD used 3D laser engraving. After the necessary deep cut engravings, the lower receiver is finished with Mil-Spec hard anodizing black coating. BAD undertook some extra steps before anodizing. They had the lower receiver bead-blasted and acid-etched. This protects the product from oxidation and contamination. 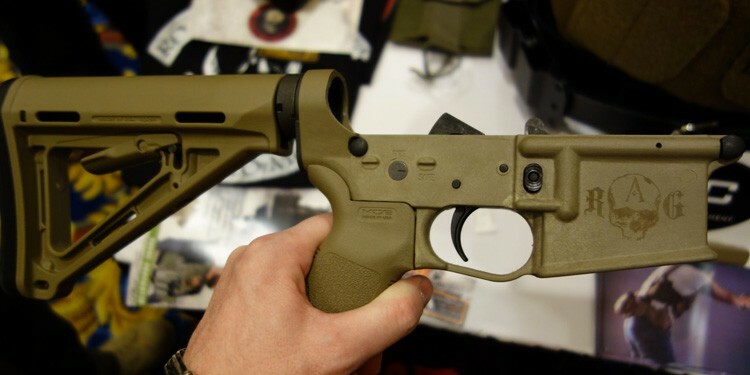 DPMS is another reputable brand known for producing gun parts for assembly. Some parts they sell include buttstocks, upper receivers, and lower receivers. If you would like, you can buy a combination of two parts to make things simpler. Their combo products are cheaper than the individual products so they’re already as good as you can get. This lower receiver has an accompanying buttstock and trigger guard. We recommend you to buy this particular combo because it’s only $30 higher than just a lower receiver. 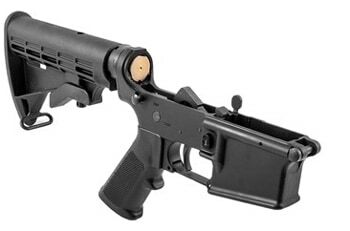 The M4 lower comes with a collapsible 6-position carbine stock. It’s made of a hard polymer that can resist impacts effectively. The lower receiver comprises of 7075-T6 aluminum. The kind of aluminum DPMS uses the strongest – the forged aluminum. It’s also coated with Mil-Spec hard anodized finishing. This coating is robust and can resist abrasion. However, DPMS wanted to level up things a bit, so they coated the lower receiver with Teflon over the anodized finishing. This Teflon is in black color and protects the lower receiver from wearing. It also has scratch resistance characteristics. The DPMS lower receiver’s magazine release can come loose after shooting several hundreds of rounds. The part won’t retract properly after unloading the magazine. However, this is only considered a minor drawback because you can just tighten the castle nut. This particular nut holds the magazine release in place. Among all of the lower receivers listed in this article, the JMT Gen 2 Lower Receiver might be the unique. Instead of the usual 7075-T6 forged aluminum, it uses reinforced polymer for its housing. Because of the material, this lower is easy to machine than its aluminum counterpart. One attention grabber is the thickness of the lower receiver compared to others. The polymer used is quite adamant in terms of strength, and the weak points are reinforced. Gen2 is actually in an improved version of their first 80% polymer lower receiver. The changes undertaken include the magazine well, the logo, and the reinforcing arms. The mag well is now enhanced to allow different magazines. As for the logo, it has been shrunk and now located at the top of the receiver. Furthermore, the reinforcing arms are now full-length from edge to edge of this lower receiver. This 80% lower receiver is easy to complete right out of the box. There are pre-machined areas such as the threads for buffer tube, bolt release cavity, and the rear pivot pin hole. You just need to finish machining some unfinished parts. One of which is the rear takedown pocket and the lower receiver is good to go. Unlike the aluminum lower receiver, you have to be careful when you’re machining this 80% lower receiver. Polymer might be very easy to machine. However, it can cause heated friction with the plastic body. This is caused by drilling too fast in which the screw would heat up and proceeds to melt the surrounding contact area of the polymer lower receiver. You don’t need to apply any coating after you finish building your AR 15 because the colors are already built-in. JMT 80% lower receivers are available in three colors: black, olive drab, and flat dark earth. JMT includes a free three-piece jig so you can start building right away. This lower has Mil-Spec dimensions and will fit most AR 15 aftermarket components. It’s only natural for you as a buyer to desire a product that has top notch qualities. Since some manufacturers don’t broadcast their quality control issues, your keen observation is a worthy trick to have. The pre-machined holes must be round and aligned properly to the other gun parts like the upper receiver. The magazine well should be machined to the proper Mil-Spec dimensions. This is necessary so the magazine you’ll load will be held securely and releases smoothly when you stimulate the magazine release. The standard finishing required for Military Specification (or Mil-Spec) is the Type III hard coat anodized coat. This finishing provides extra strength and some abrasion resistance to the lower receiver. The finishing process involves the submersion of the unfinished lower receiver into sulfuric acid bath between 10 minutes to 2 hours. Electric current transfers into the acid bath while it’s submerged. After the time specification, the aluminum oxide layer is formed on the lower receiver’s surface. For polymer lower receivers, there’s no finishing required because the colors are built-in. Also, the polymer has natural properties that the aluminum doesn’t have. It’s necessary to think through things first before you buy a new lower receiver. You need to consider your budget and the kind of rifle you want to build. 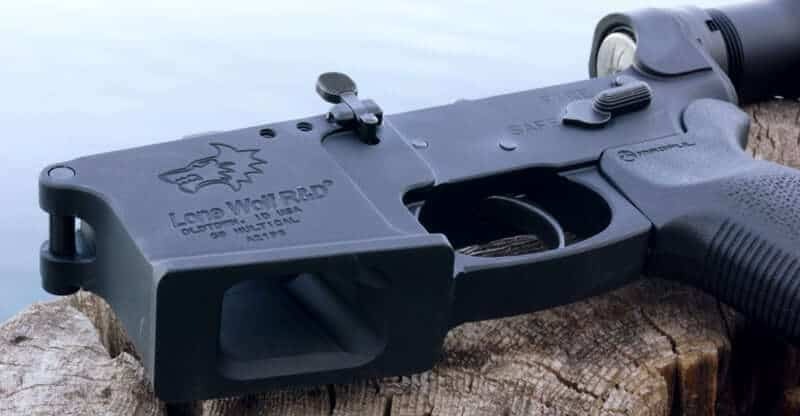 Through our buying guidelines and detailed reviews of some of the best AR lower receivers, you are now ready to buy a lower receiver that is good enough!